The Watershed Conservation Resource Center (WCRC) is pleased to announce more than $8.6 million will be devoted to a portion of the West Fork of the White River Watershed to improve and protect water quality in Northwest Arkansas over the next five years. The West Fork of the W hite River is a major tributary that flows to the White River which forms Beaver Lake, the primary drinking water source for one in seven Arkansans. The National Resource Conservation Service (NRCS) selected the WCRC’s “West Fork White River Watershed Initiative” project to receive $4.3 million in federal dollars to conduct river restoration and implement other best management practices (BMPs) on agricultural lands through their Regional Conservation Partnership Program (RCPP), an initiative of the U.S. Department of Agriculture (USDA). An array of partners joined the WCRC to support this effort. Partners’ contributions total over $4.5 million dollars in both cash and in-kind matching funds. Participating organizations include the WCRC, Beaver Water District, Beaver Watershed Alliance, Walton Family Foundation, Natural Resource Conservation Service (state and county offices), Washington County Conservation District, Northwest Arkansas Land Trust, Arkansas Game and Fish Commission, Cities of West Fork and Fayetteville, Arkansas Farm Bureau, Arkansas Forestry Commission, Arkansas Natural Resource Commission, Ozarks Water Watch, and University of Arkansas System Division of Agriculture Cooperative Extension Service. 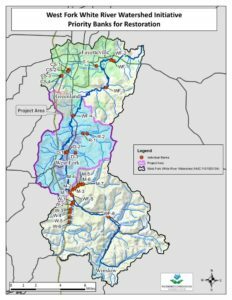 The “West Fork White River Watershed Initiative” will help ensure good quality water flows in the river and enhance the source of drinking water for Northwest Arkansas. The region is growing at about 1,000 people per month and in 2015 exceeded the half a million mark, according to the Northwest Arkansas Council. The RCPP promotes innovative projects that integrate multiple conservation approaches to work on a common resource issue, such as maintaining water quality through stream restoration and conservation practice application. The competitive grant process takes a great deal of work on the part of partners. Leading experts in watershed planning and river restoration, the WCRC built on previous watershed assessments and planning to develop an innovative proposal that addresses river instability and reduces sediment and phosphorus loadings to streams, while restoring the local ecology. The WCRC proposal was one of 265 applications submitted throughout the United States and was one of 84 selected. The WCRC will be responsible for river assessment and restoration work and will be the central organization managing funds and implementation. The Beaver Watershed Alliance will work closely with landowners who want to implement BMPs on their agricultural lands. 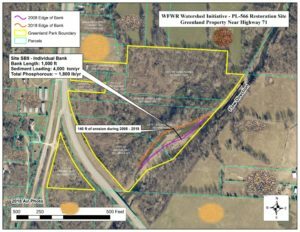 Other outcomes of the project will include an environmental assessment of the West Fork Watershed; up to 21,000 feet of riparian vegetation restoration; the creation of 150 conservation and forest management plans; the implementation of up to 300 BMPs on area farms; and the creation of five “perpetual” conservation easements. 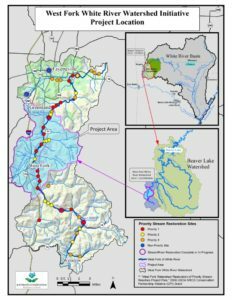 “These project out comes are consistent with the goals of the 2012 Beaver Lake Watershed Protection Strategy and are within the highest priority watershed we have,” said Dr. Robert Morgan, former manager of environmental quality for Beaver Water District (BWD). BWD supplies drinking water to the four major cities in NW Arkansas. Those cities resell the water to their customers. “This is the type of partnership, effort, and funding magnitude that will be necessary over the next few decades in order to maintain water quality of Beaver Lake and the integrity of its watershed,” said John Pennington, former executive director of the Beaver Watershed Alliance.